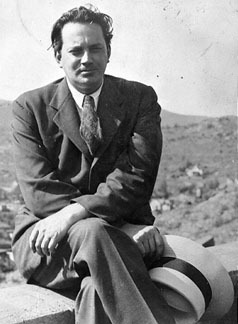 The Thomas Wolfe Collection, part of the North Carolina Collection in the University of North Carolina Library, includes correspondence, manuscripts, legal documents, family memorabilia, printed material, photographs, clippings, and recorded materials by and about Asheville-born writer Thomas Wolfe. It was formally established in 1950 with an initial gift of materials from the brothers and sisters of Thomas Wolfe in memory of their parents, William Oliver and Julia Elizabeth Westall Wolfe. The Wolfe Collection is divided into several smaller collections, each described by a finding aid. The North Carolina Collection collects Wolfe comprehensively and adds to its Thomas Wolfe Collection by both gift and purchase. Recent acquisitions have included three sets of drawings proposed for an illustrated edition of Wolfe’s Look Homeward, Angel. A small room inside the Special Collections Research Room on the second floor of Wilson Library is used to exhibit selected items from the Thomas Wolfe Collection. Materials on display include manuscripts, printed works, photographs, and art. Please ask reference desk staff in the research room if you’re interested in seeing the Thomas Wolfe Room. Access to some parts of the Thomas Wolfe Collection is restricted. In some cases, use of materials requires prior written permission from the Executor of the Estate of Thomas Wolfe, whose name and address are available from Wilson Library staff. Individuals interested in using materials from the Collection should email wilsonlibrary@unc.edu prior to visiting.